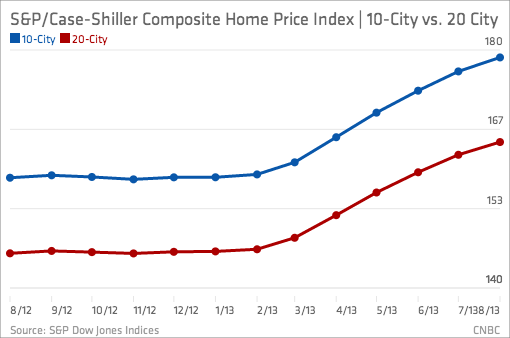 Home prices rose at their fastest pace in seven years in August, according to the S&P/Case-Shiller home price indexes, but one of the widely watched indexes' creators claimed homes are still affordable, and there is no national price bubble. Home prices are not being driven by extravagant expectations, as they were in 2005 and 2006, but by historically low inventory and strong investor demand. Sales, however, are beginning to fall off, as indicated by the latest pending home sales report from the National Association of Realtors. It showed a nearly 6 percent drop in signed contracts to buy existing homes in September from the previous month. A drop in mortgage rates from the highs of the summer has not helped home sales, as higher home prices keep some buyers sidelined. The Realtors blame a steep decline in affordability, but Shiller disagreed. Prices, however, usually lag sales, which means the big gains at the beginning of the year could soften. 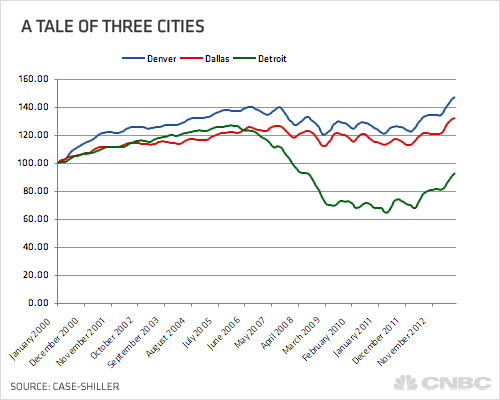 The S&P/Case-Shiller Indices are a three-month running average based on closings, so the data are somewhat outdated already. A report from Lender Processing Services shows home prices in August up 9 percent from a year ago. While inventories are still very low, they have come up about 6 percent from January to August, and that may ease price gains as well. "With survey evidence pointing to a significant increase in the share of homeowners who view this as a good time to be marketing and selling a home, housing inventory will continue to rise," noted Paul Diggle at Capital Economics. He is predicting just an 8 percent annual gain in home prices for all of 2013. The wild card continues to be investors, who made up anywhere from 33 to 45 percent of homebuyers in September, depending on varying surveys. With prices rising and fewer distressed homes on the market, some investors are pulling back on purchases. The question remains, what will they do with the thousands of properties they already own? "All these institutional investors are going to behave differently than the homeowner of the past," noted Shiller. "That's another reason to suspect that there could be a rapid turn down in the housing market, because these investors are not going to sit tight when home prices start falling. If they think they're going to continue falling, they'll get out." Shiller said he sees a tilt in public demand away from owner-occupied housing toward rental housing, even as the economy recovers. Homeownership has fallen from a high of 69.2 percent in 2004 to 65 percent in the second quarter of this year, according to the U.S. Census. He called it "good and natural" that tastes have changed. Investors are certainly reaping the rewards of that new mindset, and some say they are in this new landlord business for the long haul, no matter where home prices go month-to-month. If, however, the business model, which involves costly management of thousands of individual homes, ceases to be profitable, these same investors could easily exit in search of higher returns elsewhere.